My call to Diaconal Ministry in the Evangelical Lutheran Church in America (ELCA) is based specifically on this gospel text from John. Diaconal Ministers are called to pick up their basins and towels and wash the feet of all God’s people. Diaconal Ministry grew out of the Catholic understanding of deacons and deaconesses. On my consecration day, I was presented with a basin and towel to represent my call. It is a daily reminder to me to pick up that basin and towel and reach far beyond the church walls. I am called to bridge the gap between the church and the world. So now you can see why Maundy Thursday is one of my favorite holy days. Often, on Maundy Thursday, many congregations have their youth who are going to take their first communion do it on this night because it is the night we celebrate the holy meal in addition to the foot-washing. I am excited that we have 21 youth publicly joining us at the table tonight. What a powerful reminder of how we are all called to be fed and forgiven. This entry was posted in Uncategorized and tagged Diaconal Ministry, ELCA, Maundy Thursday by tara.ulrich. Bookmark the permalink. Appreciate your work for our Lord and Savior, and for enlightening us and sharing the "why" for this Holy of days. And YES, I do see why it is a special day for you!! So exciting that you have 21 young people joining you tonight in Holy Communion. Thank you so much for sharing this with us! Beautiful, wonderful, powerful! Love your heart. Love your calling! May your path be blessed and your mission for God be big! I really enjoyed reading this tonight Tara. This is a beautiful reflection on this passage from John's gospel. 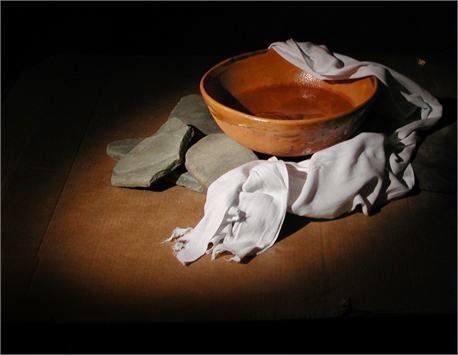 Your mention of the basin and towel as symbols of the diaconate makes me think of a song by Michael Card called "The Basin and The Towel" where he tells the story of Jesus washing the disciples' feet and then goes on to relate it to the fact that we are all called to love and serve our neighbour. Here's a link to a YouTube video of it. The video just has a static image, but you can hear the song: https://www.youtube.com/watch?v=PUT_rSXjXNY Great post, my friend! Funny you should bring that song up. It actually is a song we have used for some informational videos etc to talk about Diaconal Ministry. I love it. Thanks for sharing the link friend! THIS must be included in you-know-what. I've never understood Maundy Thursday until right now. Yes… same here! This is so good, my friend!